2015 is the 15th anniversary of the Granite Island restoration. It is worthy of a �look back� at the people and firms that helped make it happen. Carpenter Stan Stenson and Project Manager John Blanck led the start-up team. After the 2-1/2 years in process several people were recognized for their special contribution as �Honorary GI Light Keepers�: Stanley Stenson, John Blanck, James Eaton, Frank (Mike) Smith, Warren Smith, and Gerhard Heimowski. Also those that helped: Ron Thill, Ron Ryoti, Ken Czapzki, Bill Flanigan, Rich Heinz, Dan LeBert, Ken Selle and Father Lloyd, Cecil Smith, Doug Weesen, Dan Audette, Buck�s Drywall, Feltner Plumbing, Da Dupras, Pete Frazier, U.S. Coast Guard, Mike Baker, Bill Thumb, Tom Kreig, Brian Benzie, Dave Lindeblad, Dave Berry, Dan Cook, Jason Bernard, Charlie Gatdza, Craig Carson, Steve Hildinger, Terry Horton, and my Cousin, Frank (Bud) Smith. A special thanks in the intervening 15 years for their hundreds of hours of volunteer service in keeping this place going to: Frank Smith, Warren Smith, Dan (Ducky) Chiconski and others who may forgive me for not mentioning their name. Stanley Stenson was the Lead Carpenter for the restoration project and started work on May 20th, 2000. He and his crew lived in a tent on the Island Monday thru Thursday each week for the summer of 2000 and finished July end in 2001. John Blanck was the project manager from May through July in the 1st year. Lukeas Stenson is Stan's son. Notes from their first weeks on the island are integrated with other notes below and are highlighted in red. Notes that were added to the logbook in the lighthouse will be added to this history later. March 24, 2000 - Contractors first visit to the island to document with video the structure and surroundings. Also taking measurements. April 27, 2000 - My first visit to the island in 35 years as the new owner accompanied by my wife and several people who will be involved in the restoration effort. Rob Clark from the Bay City Times in Bay City, Michigan was also along and published a story in the Sunday, May 14, 2000 edition of the newspaper. The second photo is of my first steps on the island in 35 years. May 20, 2000 - My second visit to the island. Contractors have been staying on the island for the last few weeks. They have completed building the steps from the boat landing to the lighthouse and are almost finished removing the plaster, lathe and other items necessary to expose the wall studs throughout the interior of the building. 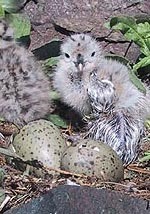 May 22, 2000 - First seagull hatched. We got the downstairs cleaned out and burned. We had a light rain - 45° - 55°. May 23, 2000 - We got the lighthouse pretty much cleaned out. Just the kitchen left. We thought of a way to get rid of the seagulls - put chicken eggs under the seagulls. I'm still looking for the red paint can. May 24, 2000 - Re-done the kitchen floor. John and Jeremy worked on the decking. Seen a red bird today. Very windy today. Very windy! May 25, 2000 - Windy day. 40° - chill, 30°. Guys took last of tobacco. Anxious to get home. Dave called. He's not coming to pick us up. What a disappointment! On the bright side, Scott said it was ok to take some flowers home. John said they may be poisonous and wipe out all our flowers. The guys are content playing cards and snacking on leftover treats. Maybe Dave will pick us up at 8 tonight if the lake settles down. May 30, 2000 - Cloudy day. It rained. The boat for the materials didn't show up. Waves too choppy. We moved the bags closer so we can send them down to the derrick pole. Tires back up the rocks. Finished tearing out rotten boards and cleaning up the lighthouse. Finally put a light in the tent. What a difference! 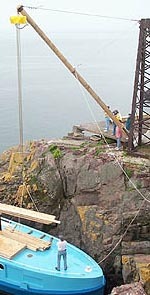 May 31, 2000 - Worked on pads for decking up by the lighthouse. A load of lumber came in today. What a job to unload and carry up to the lighthouse! The wind came out of the south. Beautiful day. June 1, 2000 - Worked on downstairs floor joists and deck posts. Rained today. Needed it. Looking forward to going home. June 2, 2000 - Worked on decking and walls in the lighthouse. The wind blew hard this morning. We were up early - all out of bed by 5 o'clock this morning. Dave wasn't coming early. Says it's too wavy. Won't be till 9:30 tonight. We all got anxious, so John called the other boat. Now we have 2 boats coming and John's hair is getting grayer all the time. June 5, 2000 - Worked on upper decking. John and Brian worked inside. Dan, the electrician, worked on the upper floor. We celebrated Brian's birthday tonight. It may have been the first birthday celebrated on the island in 50 or 60 years. June 6, 2000 - It's the warmest morning thus far. Worked on decking and flooring in kitchen. Hauled a bunch of lumber up to the hill. June 7, 2000 - Saw a Herring Seagull stuck in a board. Lukeas ran down to the tent and back with a camera, but Doug let it go before he got there. Luke was out of luck. No lumber delivery today. Running out of material. June 8, 2000 - Load came in - what a job! Worked on decking. Left in a hurry today for the mainland. Storm warnings. June 12, 200 - Small craft warning today. We made it out safely. Actually, it was a beautiful workday. It must have stormed here over the weekend. Worked on upper decking. June 14, 2000 - It rained during the night. Plumber came this morning to look at the job. Plans on coming out later part of next week. Worked on upper decking. When you work together and share the same tent and meals, you get to know each other pretty good. As in any setting where you are together day and night, temperaments have a way of coming out . . . and I know I wasn't excluded. As a whole -- I think we were blessed with a well-balanced group of workers - each adding their style and individuality. It was a memorable experience. One, I am sure, none of us will ever forget. Thank you Scott and Martine for asking me to come aboard your adventure. 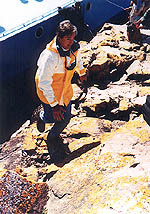 Monday, June 19, 2000 - Steve Hildinger, the newest member to our Granite Island hard-labor crew. . . . He seems like a pretty nice guy. Work-wise, the kitchen has three walls framed up - thanks to 10 hours of work. Brian and Jeremy put the roof on the west-side dormer and have it all felted. Down at the northern boat entry, John put bumpers up so that we can have that side as a mooring option. The guys who are restoring that old crane to operation got the wooden beam in place after quite some effort. John and Doug put in their share of work, today, as well. They got cement pads poured outside the front entry and prepared a bunch of old bricks for, what I'm assuming will be, the center of it. Wednesday, June 21, 2000 - The weather turned beautiful today. Quite a change from yesterday, although this afternoon the wind picked up to some incredible speeds. This afternoon we were working on the south roof replacing the fascia and putting extensions for eaves on the sides. The winds created a challenge in maneuvering materials around and keeping roof tiles from performing aerial acrobatics. Monday, when we came back to the island we found our miter box jig dumped over on the side of the hill. Today, we discovered how. . . Dad and I were ripping a board on the table saw. The wind was just blowing like you wouldn't believe. Trying to finish what we were doing as quickly as possible. Suddenly the whole chop-box and board got caught up in a gust of wind, and lifted up and moved over, falling on the ground next to us. I think that the wind today is the strongest it's been since I've been here - as well as the waves (5-7' or so). Like I was saying before, we were working on the roof. The rocks on top of the wall, needed to be broken away to make room for a new top-plate and the replacing eaves and fascia. The top-plate was a bugger to bolt in place. We had a hard time finding a spot where the mortar wouldn't crumble away and our bolts were too short or the wrong size, etc. :-) But, we got it done, eventually. Brian got just about 90% of the spindles screwed to the deck railings - today as well. It looks really good. Workwise, that's what happened today. More seagull chicks hatched. Quite a few additions to the Grand Colony Home have been introduced to the world. I still think we should bring one home. Dad got a cold and sore throat yesterday - as well as me. We're both feeling better today, but Dad's voice is barely operable and my nose is plugged and I'm congested. Oh, well. At least we're not sick with the flu or something. Tomorrow we're expecting a shipment of supplies on Thil's boat early morning sometime. It's supposed to be big. More exercise! Steve is going to get his "real" breaking-in session then. While I've been writing all this, a warbler or some other songbird has been repeating his song over and over. It's a fantastic change from gull squawks. End of day 3 - week 4 for me. 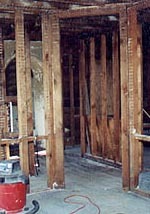 June 23, 2000 - Contractors have finished removing the plaster, lathe, and woodwork to expose the frame of the building. Except for the hole through the roof and the second floor it is in excellent shape. Stairs with railings from the lower part of the island to the lighthouse has been completed. A deck around the building is underway. 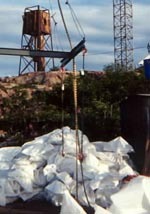 The Derrick has been refurbished and is in use. First load was lifted today. September 30, 2000 - USA Today visited the island to do a feature story for their television news program. December 13, 2000 - Last trip to the island in 2000. Web cam #4 was installed and then failed a few days later. Will have to wait until next year to repair it. The dock was chipped from the ice covering it and raised up on the island for winter storage. April 18, 2001 - First trip to the island in 2001. Web cam #4 was repaired. July 4, 2001 - Began moving furniture into the lighthouse. 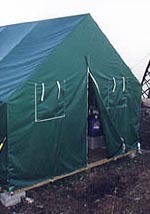 January 3rd and 8th, 2002 - Two history making trips to repair the weather station. February 6th, 2002 - Another record breaking trip to the island to repair the weather station. 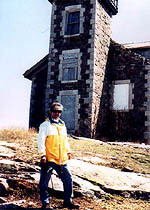 April 13, 2002 - Traveled to the island to repair weather station and web cams.